Common citizens are not interested in terms like DGP, GNP, fiscal deficit and debt servicing or even rising levels of foreign exchange and favorable promises by ‘friends of Pakistan’ and other donors and international financial institutions like the IMF and or the Word Bank. "What good are these figures if prices of utilities and commodities skyrocket after every ‘awami’ budget? How much longer can one live on the promises like: "We have to make sacrifices for long term benefits" or "it is due to the doing of previous governments,” says Abbas Khan." And that is precisely what we have been hearing in the past. It is in this context that common people view conflicting messages, new hopes, and more promises that start pouring in from Islamabad before budget every year. Besides moon and stars, every one in the government gives good news about pay increase of the government employees, relief for common man, reduction in different tariffs, repealing of surcharges, adjustments in tax rates while the populace keeps staggering under an ever increasing burden of living. And empirical observation is that going gets tough after each budget. Another reason for lack of interest in budget proposal is that like most of the legislations and legal notifications, budget proposals every year are a poorly written, ambiguous, complex and full of loopholes document that only sharp accountants can decipher. The situation is not helped by the technocrats turned politicians who purposely overcomplicate the budget declaration in an attempt to obscure the true implication and impact of the measures being announced. What cannot be easily understood cannot be easily attacked, and the tax payers are left vague and bemused. Which is why not one listens to the budget proposals being presented and prefers to wait for newspapers next morning instead? That said; let us review the national economy. Pakistan is an impoverished and underdeveloped country, suffering from extensive terrorism, internal law and order situation and political disputes, low levels of foreign investment and above all very costly governance. Pakistan's economic prospects, although still marred by poor human development indicators, continue to improve mainly due to inflows of foreign assistance. Foreign exchange reserves have also shown growth due to increase in recorded workers’ remittances. Long-term prospects remain uncertain as development spending remains low, and political tensions weaken Pakistan's commitment to lender recommended economic reforms. One of the more farcical aspects of the Pakistani budgets is the element of spin and rude uncertainty that accompanies the lead up to the budget. So what people do? Instead of waiting for the federal budget they concentrate on their personal budgets and how to make the ends meet particularly when most of the income middle class have is spent on living – education, medical and daily sustenance. There is no saving whatsoever. This time, instead of trying to predict and analyze the realities I took a chance to see how people make their personal budgets. Or do they, in the first place? I asked people from different segments of our multi-classed society to account for their monthly income and spending. All the accounts were very revealing. This is the story that moved every one. An old lady named Suban, in her late 70s may be (she did not know her age, lives alone with no male member to look her after). Having lived all her life in the remote village in the backwaters of Punjab, her total possession is three goats. She takes them out for grazing every day and also performs other domestic chores single-handed. She is healthy, active and happy with life. I asked her about how she manages her expanses (read budget) and what are her dreams? On lot of coaxing she said, "I will be happier if my goat delivers three lambs this time." Surprised, I asked her to explain. She said, "I don’t have very many requirements. I will sell the lambs and put a new roof on my home and will sell all the milk to live comfortably!" Her budget is simpler but life certainly is tough. ''if my goat delivers three lambs this time." We, as a nation, are waiting for ''our own three lambs''no matter what happens to budgets or fiscal policies. 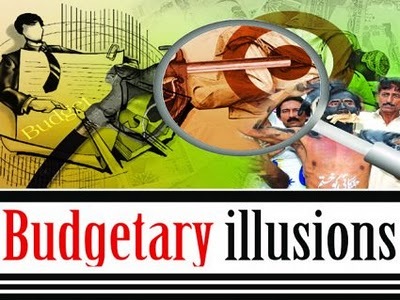 Truely speaking, I was, once, a regular analyst of budget and post-budget proceedings but now these proceedings have lost their worth....No price is fixed in the budget, there is a joke of mini-budget, shopkeepers are charging their own prices in the far off areas and the writ of government lies only in major cities. It is a very insightful blog, highlighting the true picture of our national budget and people's reaction to it. Really, we, as a nation, have lost all the hopes regarding budget and social and human welfare on the part of government. Apart from it, today it is real hard to make and maintain a budget on our family level due to the rapid change in the prices.